This sacrificial Khukri comes with a beautiful rosewood dhankute scabbard that has Nepal's national symbols and also with dragon carving on both side of blade. This is a large type of kukri used for sacrificing animals during festival, therefore the name 18" sacrificial. Dashain, the main festival of Nepalese, which mostly falls in October, is celebrated by sacrificing animals (buffalo/goats) after necessary rituals are done on a special day called Maar. It is a tradition in Nepal that families celebrate the festival by purchasing domestic animal from locals and sacrificing it at home or mostly at temples as an offer to the goddess Kali Maata. It is a myth that the whole community where the ceremony is performed will suffer misfortune if the beheading is not done in one clean stroke. It is a very special knife as it carries a religious background. All the making and building of the kukri is done by hand using only conventional domestic tool. It takes three men three days to finish this kukri. 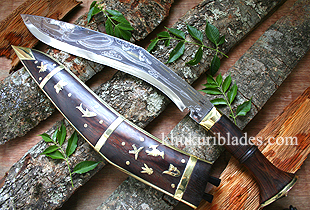 This Sacrificial Khukri comes with a decorated dhankute rosewood scabbard with Nepal's national pride symbols like the King's crown, national bird (Pheasent), national flower (Rododendrum), national fish (Aasala) and Gurkha's insignia (Two kukris crossed). A beautiful kukri to collect.